Some days I just feel buried in toys. At times I have wished we didn’t have any. But then I realized that I just needed easy toy storage and organization solutions…and a little less! I recently made it my goal to go through every single item in our house and to only keep what we really loved. Be careful what you wish for. Since that idea popped into my head we unexpectedly moved – twice. It was a total of 900 miles, and I literally did have to go through everything. Right before we moved the second time, I found out about some incredible ways to organize our bazillions of LEGOs, beloved stuffed animals, and cherished cars. When I found out about these, I knew right away that these would be long-term solutions I had been dreaming of. The owner of this family owned business, Creative QT, sent these as a housewarming gift (one of my favorite parts about working with small businesses), and I have been so excited to show these to you! I love that these organization solutions make it feel like we have less, and we have been able to keep with us all the toys so much better. That means more time for stuff we really love to do! Here are the brilliant organization hacks we came up with. 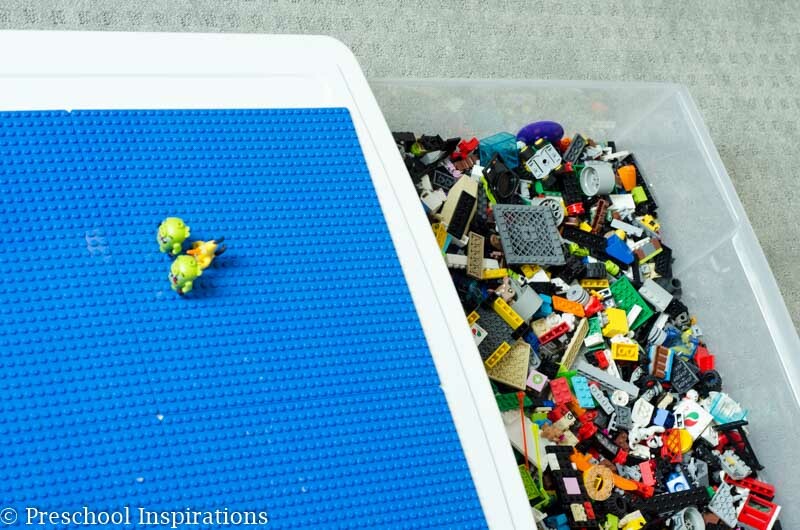 If you have been on my Facebook page, you have probably seen these brilliant peel-and-stick baseplates. I love that there was no super glue struggle like you might have with typical LEGO basepaltes. We just peeled off the sticker and placed the baseplates on a table I already owned. My daughter is in heaven with these pink and purple baseplates, and they are also available in blue, green, grey, or tan. Our toddler even got her own Duplo table with Duplo baseplates! 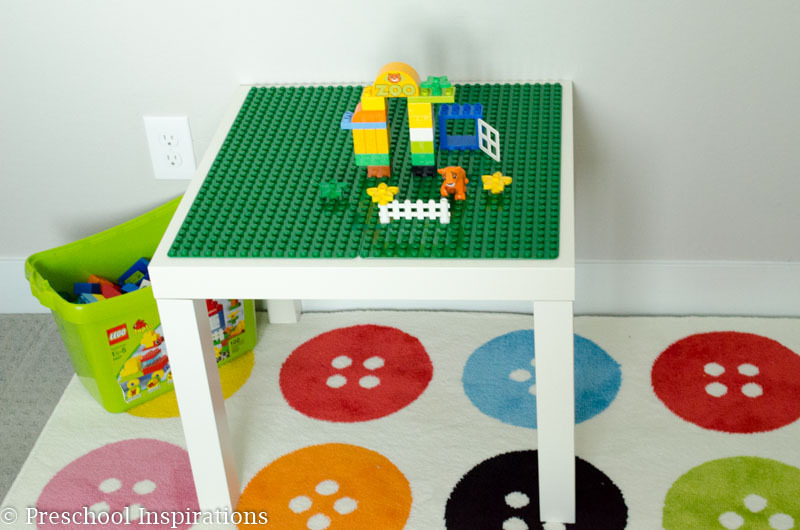 We grabbed this table from IKEA, and it is the perfect size for these baseplates. Even my big kids love Duplo so it’s a great compromise if she wants to play with them, and they don’t want her nibbling on all of their LEGO minifigures. 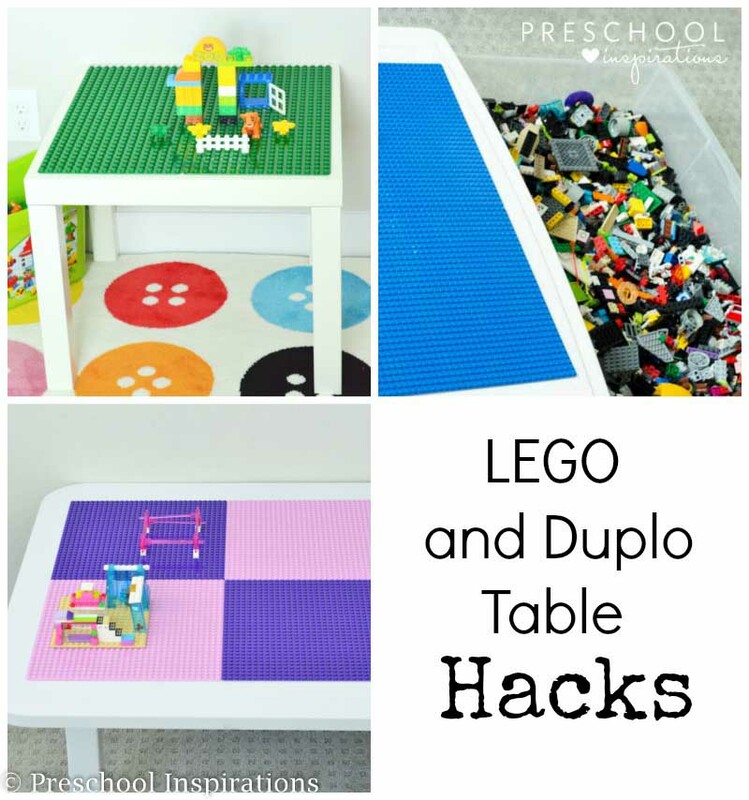 I was worried about a LEGO table for my son. He gets easily overwhelmed by LEGO pieces all over, and then he freezes up and I end up walking on torturous LEGO pieces in his room. For him, I found this extra wide under the bed storage drawer. This way he doesn’t have to take any LEGOs out. We just pull the drawer open and push it back in. No mess, ho hassle, and it goes under the bed easy peasy. These containers are not available everywhere, but they are available online. We grabbed ours from The Container Store because that was the most affordable option, but you could find one similar on Amazon. This solution isn’t as sturdy as a table since it’s a container, but it is great for small LEGO projects. For us, it has been totally worth it to keep the LEGOs from taking over his whole room. And then anything he wants to save easily fits under the bed too. Where has this been all my life? 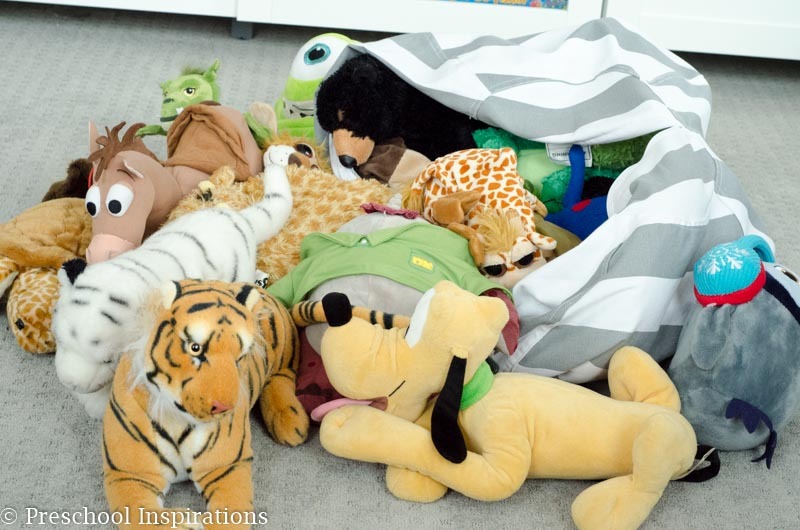 Stuffed animals that used to flood the floors and beds are now a thing of the past. 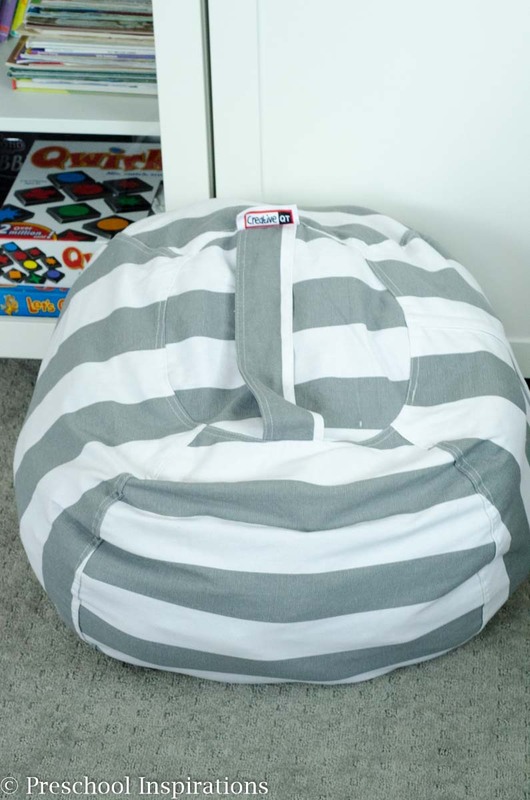 Look how many stuffed animals fit in this bean bag! I love that now whenever I tell my children to put away their stuffed animals, they find it exciting. They enjoy putting their little friends in this cozy home, and it is a great place to rest against or sit on. Since I got this one, two more designs have come out: blue polka dot and floral! 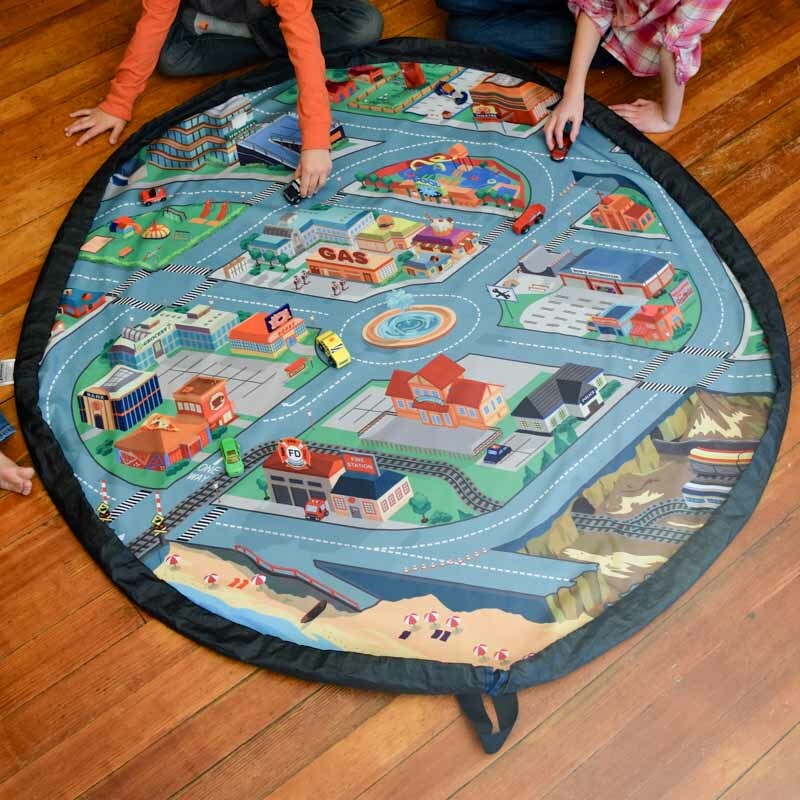 I’ve had a car play mat in all of my classrooms (usually in the block area), and I love that this car play mat is just like that but mobile! And here is the brilliant part — it turns into drawstring bag that can store all of the cars and small toys with it! So many times I’ve worked or volunteered in programs where a car mat would have been perfect but they didn’t have the storage or room for one! This is the perfect solution for that, and it works great for a home too. 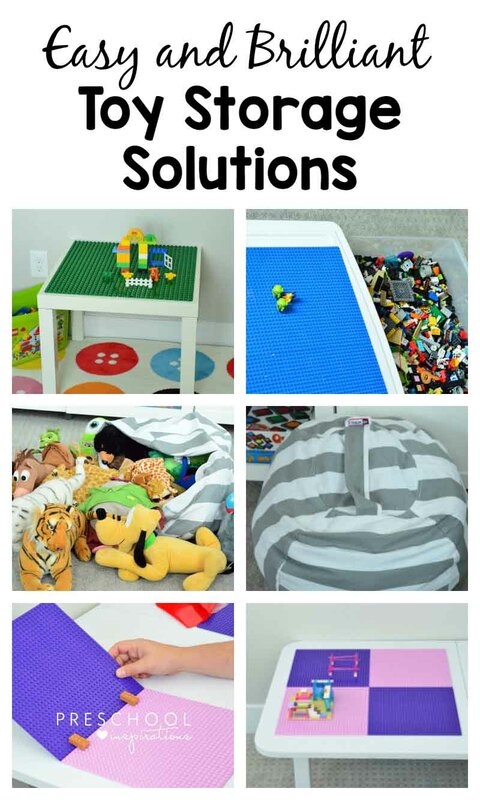 I have been so pleased with how these easy and brilliant toy storage and organization solutions have turned out for us. I am not so overwhelmed by the thousands of LEGO pieces, and it has been so great to keep the floors from filling up with toys. Now, we just need to figure out a system for dirty laundry that ends up all over the floor instead of the hamper.